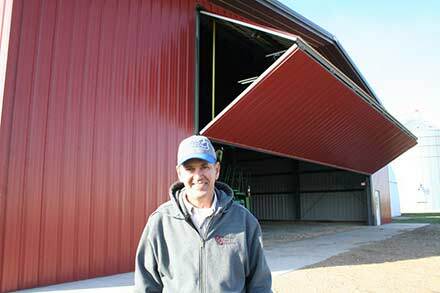 Frans Rosenquist has four large bifold/liftstrap doors at his farmsite north of Atwater, MN. Two sliding doors were replaced with Schweiss bifolds. 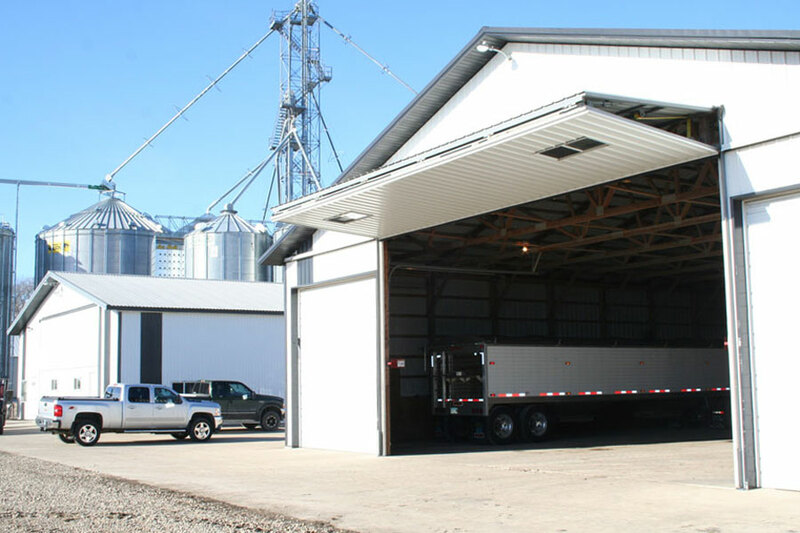 The largest of Rosenquist Farms four bifold doors is a 45'x17' clear door with remote opener. The other three vary in size from 33' wide to 31' wide. What Rosenquist did was position himself on a fast-moving snowmachine as a professional racer - he was good enough to bring home the bacon on most weekends, and good enough to eventually be inducted in the National Snowmobile Hall of Fame in 2006 in St. Germain, Wisconsin. 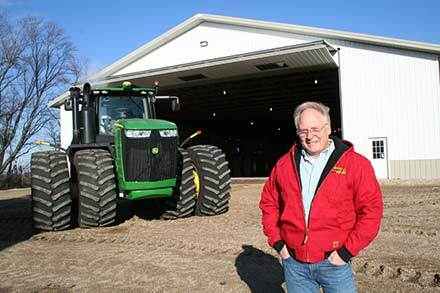 "I started farming on my own in 1978. 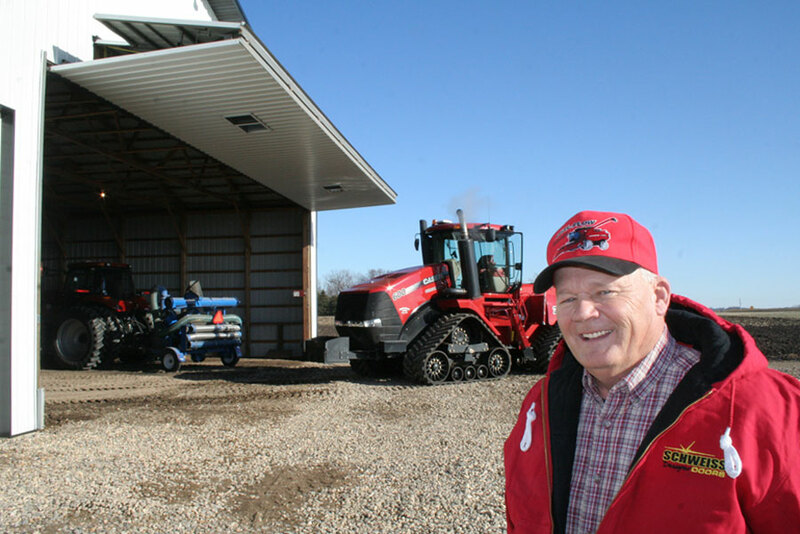 When I was right out of high school, doing road construction I helped my step dad, Jim Mohr, farm his 160 acres," noted Rosenquist. 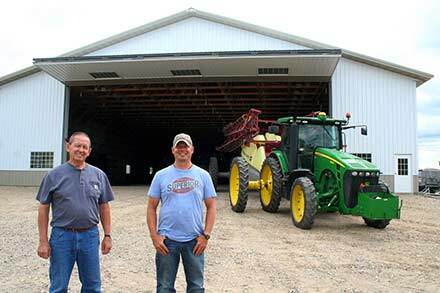 That was a far cry from the 6,000 acres Frans, his wife Debbie, their son, Jason, and son-in-law, Brandon Barber, now farm north of Atwater, MN where they grow corn, soybeans, peas and sweetcorn. 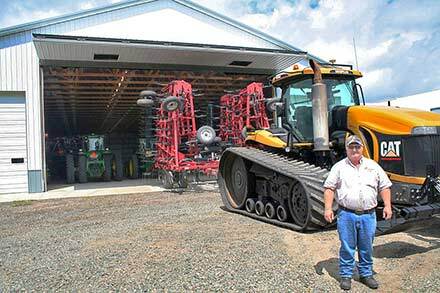 "I bought my first tractor and equipment with racing money. I raced professionally for the snowmobile manufacturers starting when I was about 19 years old. The Ski-Doo I raced is also in the Hall of Fame. We raced the oval tracks. I started racing in the early 1970s and signed my first contract in 1977 with Yamaha snowmobiles. 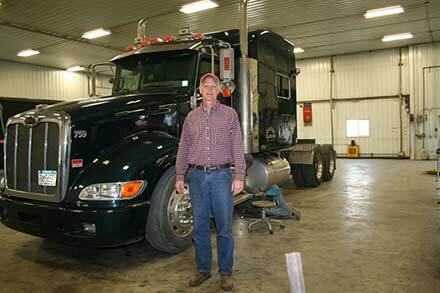 I took that contract money and went out and bought a new International tractor, plow and digger and paid cash for it. Every weekend I'd go to the races and come home with about $3,000 to $5,000. We flew all over, so I didn't have any expenses, I give up a portion of my winnings to my mechanic. I raced in Alaska and won a race in Finland worth $10,000. 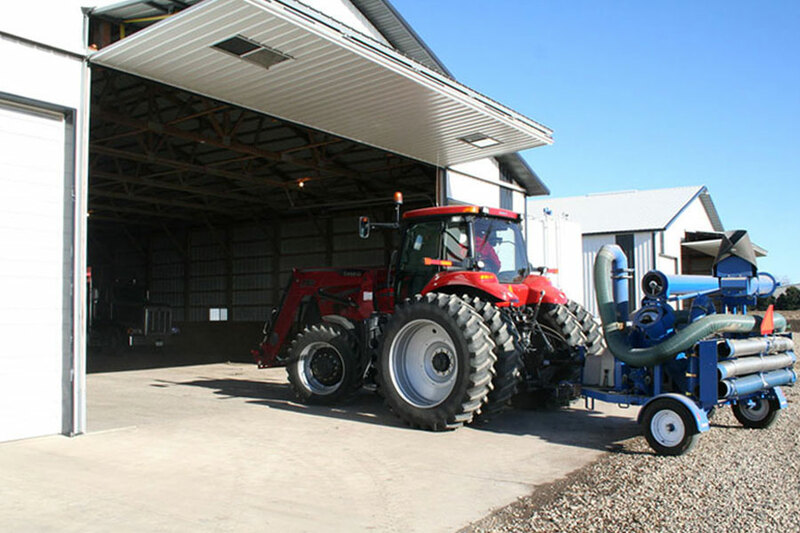 Coming back from that race, I bought a new corn planter. 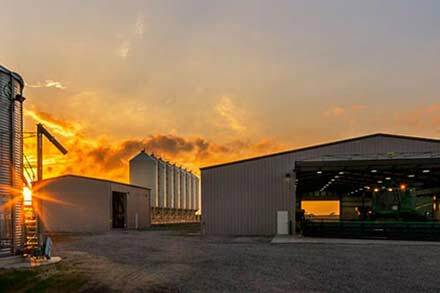 I kept doing this, got married and rented a 240 acre farm that I now own," recalled Rosenquist. 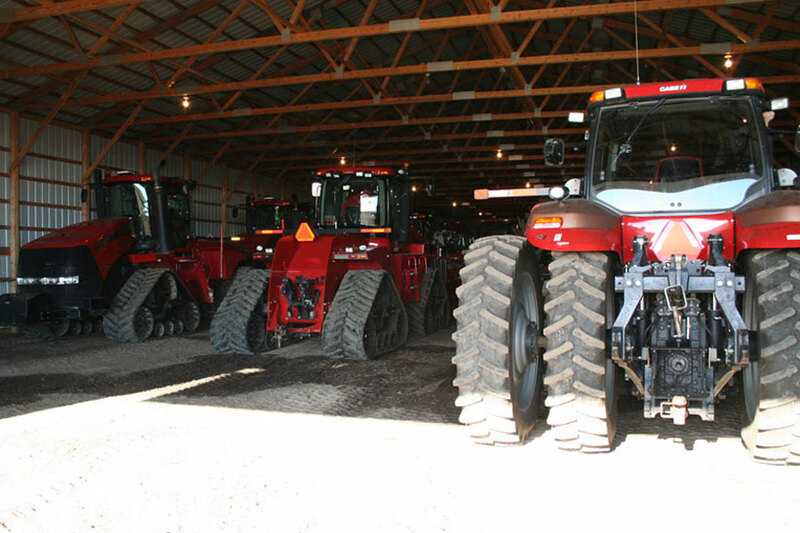 The Rosenquists have four quad-track Case IH tractors to use on their 6,000 acre farm. 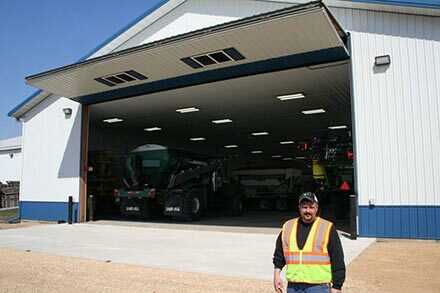 "The first bifold door I ever had, about 17 years ago, was a new bifold cable door that came out of Wisconsin. We hadn't run it for about a month and the dang cables broke on it. I called the manufacturer and he told me that they updated their door, but they weren't going to stand behind my door so we put our own bigger cables on it and kinda fixed it ourselves. The door was sprung and never worked right. I had my fill of that company, so I bought my first Schweiss bifold door and it worked so good. 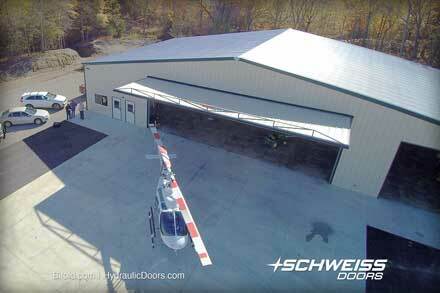 So every time we built a new building or updated another building, we put a Schweiss door on it. 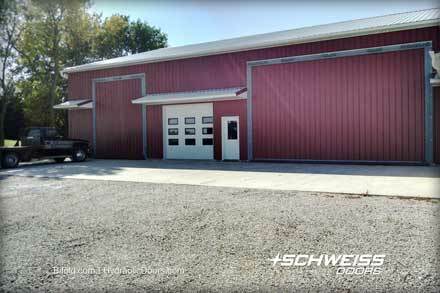 We replaced that troublesome cable door with a new Schweiss door with a walkout door." 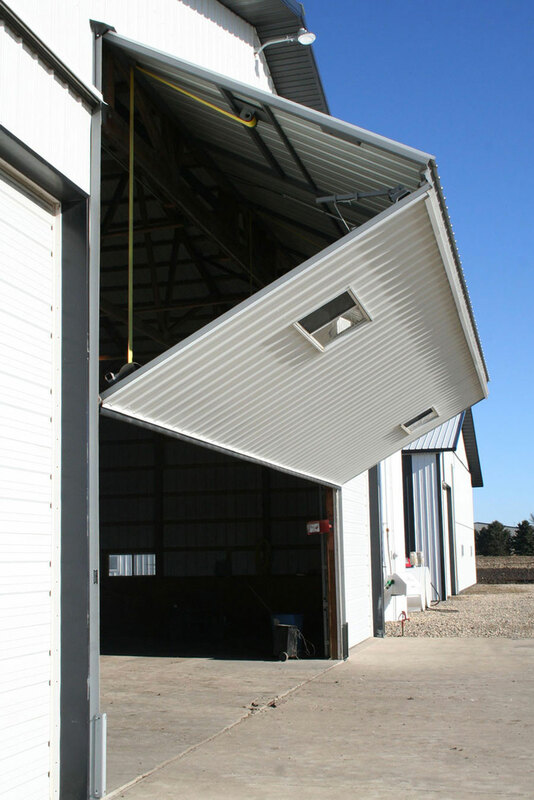 Bifold doors can be stopped and locked tight at any level. Strong liftstraps hold the door in place. 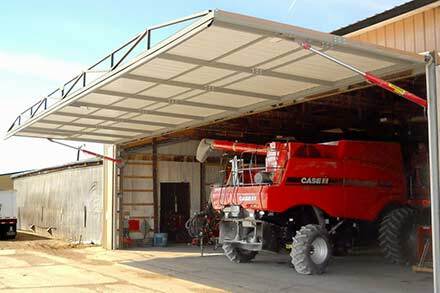 When bifold doors are opened wide they provide a nice shaded canopy which also keeps rain outside the machine shed. 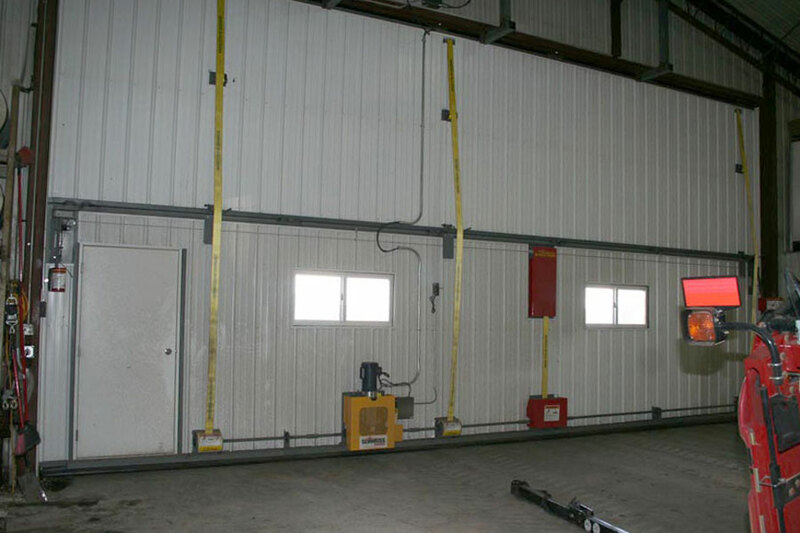 The liftstrap doors open and close faster than cable doors. Frans started racing as a teenager up until 1985 then decided to retire after qualifying for the World Championships a remarkable six times. Son, Jason, who is also quite competitive, took up the sport, but there was no longer the money in it like when Frans was active. So now tractor pulling is their hobby, with Jason doing most of the driving. 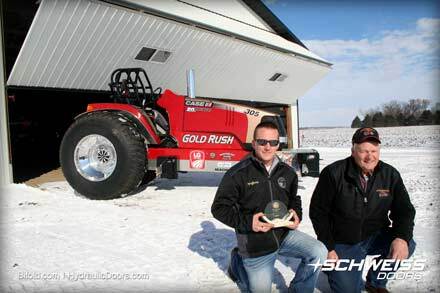 Their custom souped up diesel pulling tractor is called 'The Gold Rush. 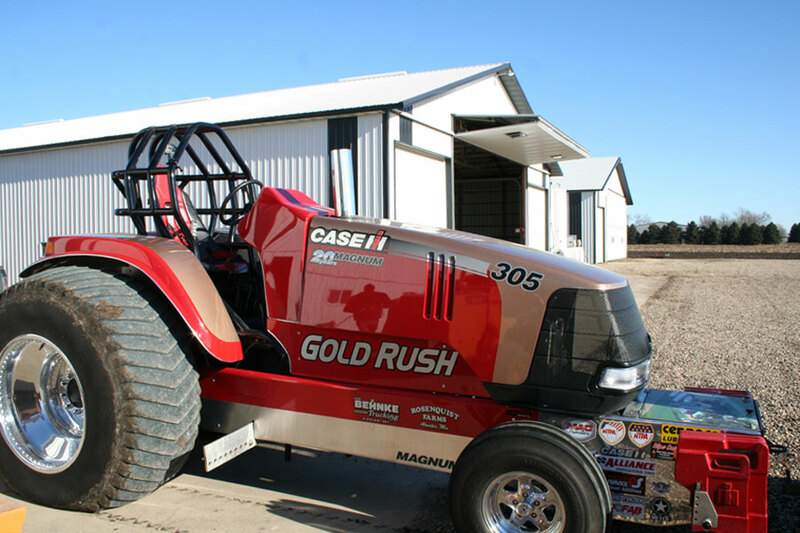 The Gold Rush is a 2,500 horsepower Case IH 305 Magnum. 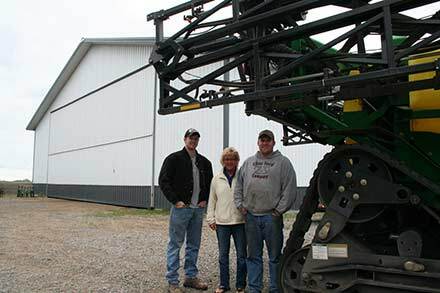 He and Jason compete in tractor pulls about 15 times a year and win quite a few. 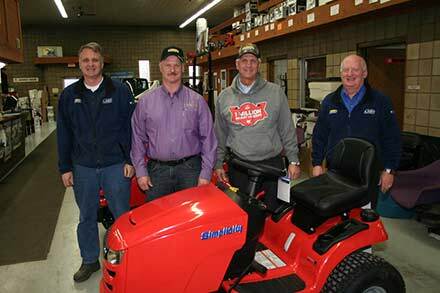 Frans is now out of the snowmobile racing game, but he and his son, Jason, use this souped up 2,500 h.p. 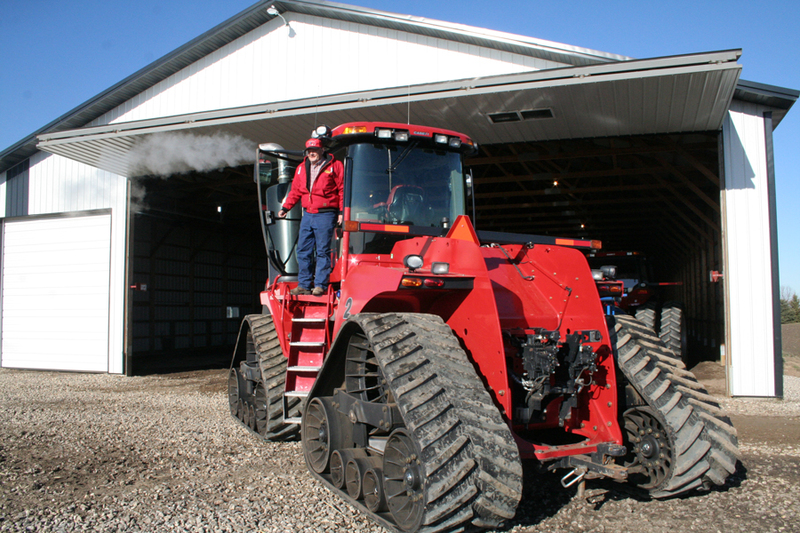 Case IH diesel named "Gold Rush" in about 15 tractor-pull events during the year. "At first I never drove it, Jason always did. I told him at the last pull that I wanted to drive; I'm not getting any younger, I could have a heart attack tomorrow. I got on it and killed it right off the bat. You get two tries; Jason jumped up and said open this thing wide open, it has to be screaming when you let the clutch out. I did and the front end came off the ground and I put about 60 feet on the next guy and won my first race. It was pretty cool," said Frans. 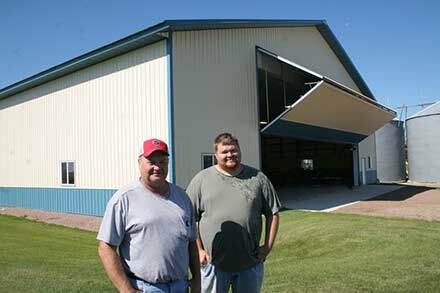 As the Rosenquists farming operation grew, they needed buildings to house an expanded line of equipment, and those buildings needed quality doors. 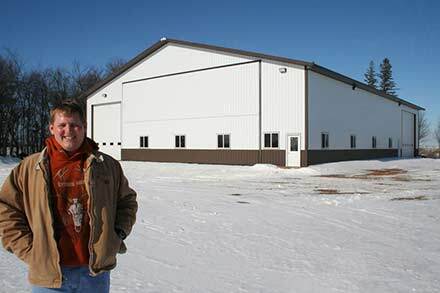 Their largest machine shed, built by Litchfield Building Center, is 200'x66'. 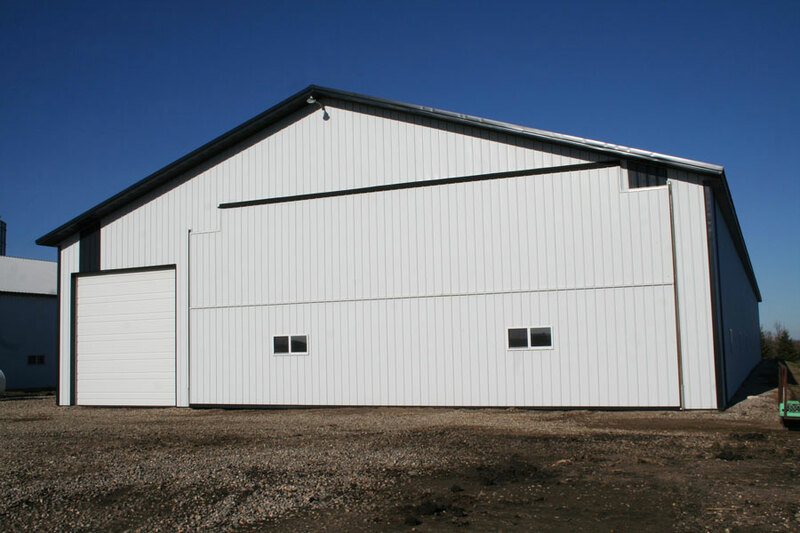 Rosenquist Farms now has four Schweiss bifold/liftstrap doors with autolatches. 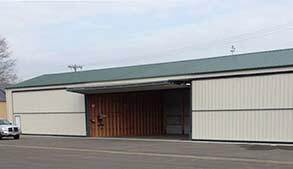 The largest of the doors is a 45'x17' clear with remote opener. Windows were added for a nice look and give added daylight into the building. 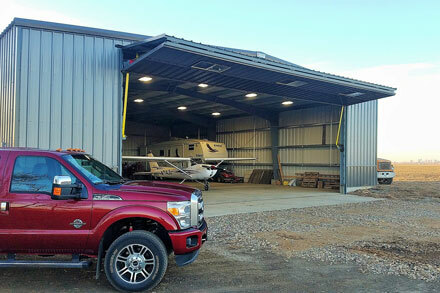 The other three doors range in size from 33' to 31' wide and up to 16.5' tall. 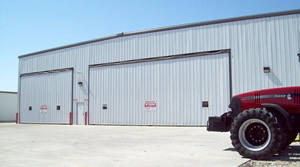 Two of these doors replaced sliding doors on existing buildings. 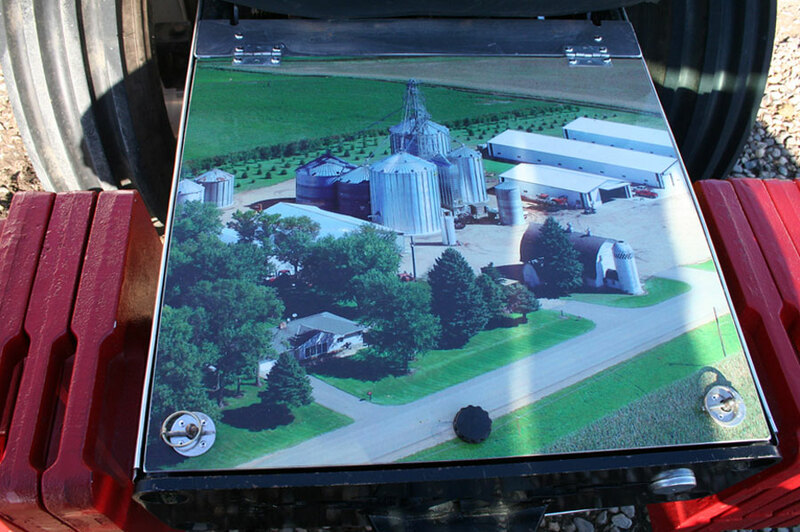 The Case IH 305 Magnum has a customized look with an aerial view of the farm at its front. 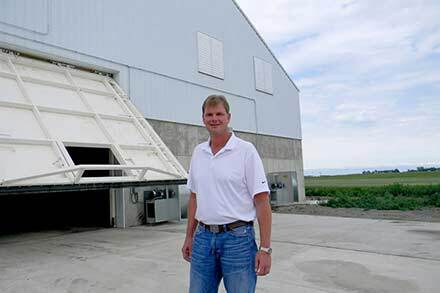 "The first bifold door I ever had, about 17 years ago, was a new bifold cable door that came out of Wisconsin. We hadn't run it for about a month and the dang cables broke on it. I called the manufacturer and he told me that they updated their door, but they weren't going to stand behind my door so we put our own bigger cables on it and kinda fixed it ourselves. The door was sprung and never worked right. I had my fill of that company, so I bought my first Schweiss bifold door and it worked so good. 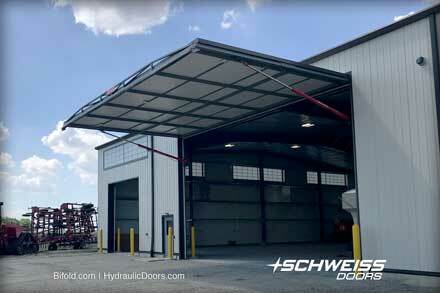 So every time we built a new building or updated another building, we put a Schweiss door on it. 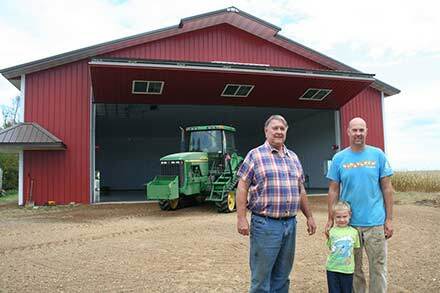 We replaced that troublesome cable door with a new Schweiss door with a walkout door," said Rosenquist. 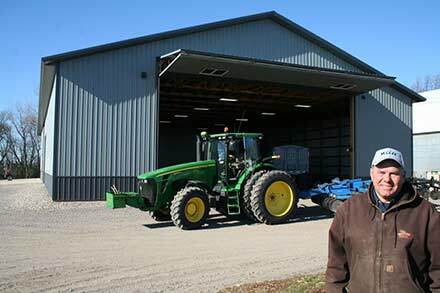 "Those sliding doors are a waste of time and money, you might as well spend a little extra right of the bat and do it right. I guarantee you that after a few years you'll be replacing them after the wind picks them up, twists them around and when they get ice on the bottom so you can't slide them." He said he didn't look at any other manufacturers doors. He studied the sales literature and determined that Schweiss had the best door out there. 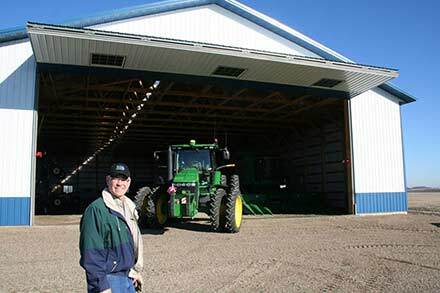 He thought he first looked into Schweiss Doors at the Minnesota Farmfest show. Going back to the old days, he said he was familiar with the Schweiss name because his dad had a Schweiss Chicken Plucker that had the Schweiss name on it. 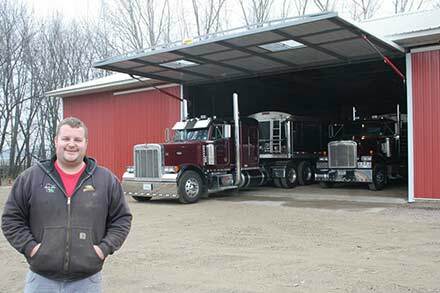 "I never could really buy into the swing out doors, I like the bifolds. 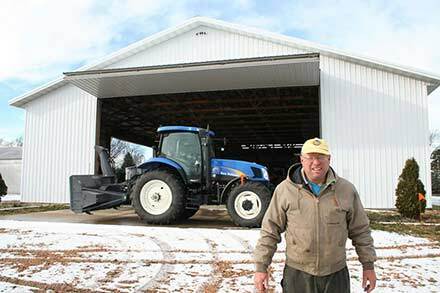 The reason is we get the darn snow that blows in here and with the bifolds I can raise them up and take the loader right out. I've had times here where we've had five feet of snow blow in. 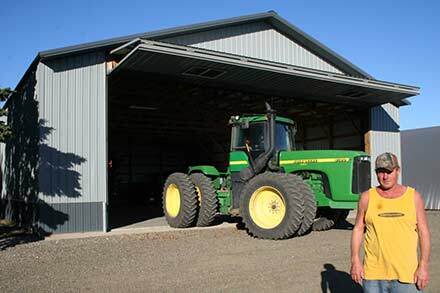 If I have the loaders in the shed, I'd have to start shoveling if I had a hydraulic door. The other thing is, we get some blasted windy days here and if you have a 40 foot door straight out that's a lot of wind resistance," explained Rosenquist. 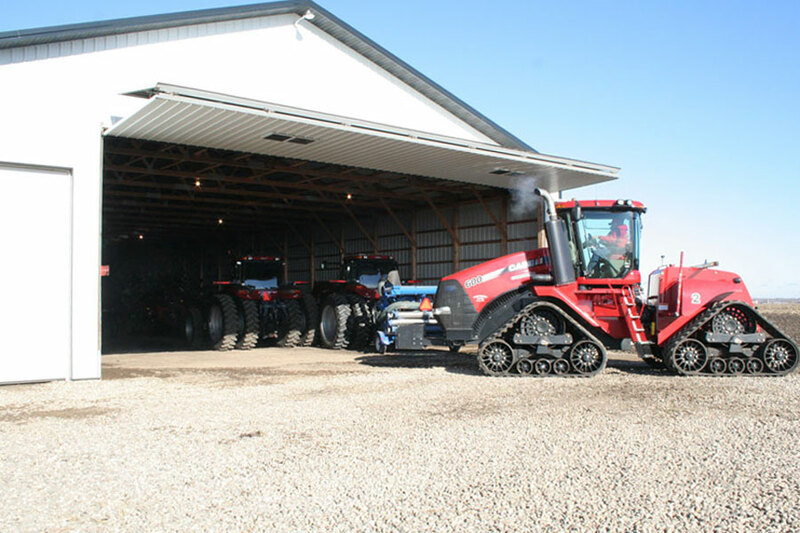 Tractors and other field equipment pretty much fill up this machine shed. 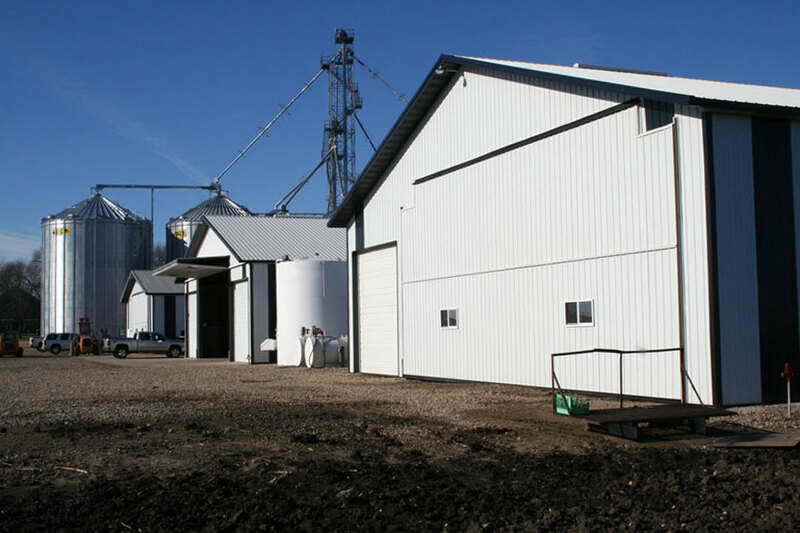 He's impressed with how easy the doors are to run and how quiet and smooth they operate. 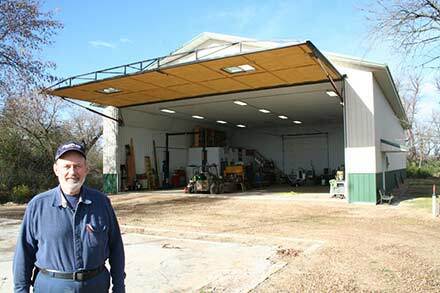 He wanted a door that was efficient, didn't break down and always worked. 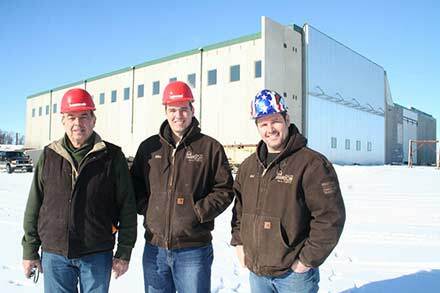 He complimented the Schweiss Doors crew that installed his doors and said they came when they were supposed to and everything went as it should have. 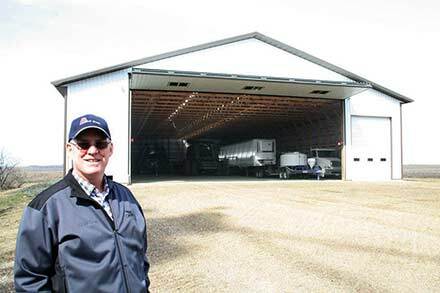 "Those sliding doors are a waste of time and money, you might as well spend a little extra right of the bat and do it right. 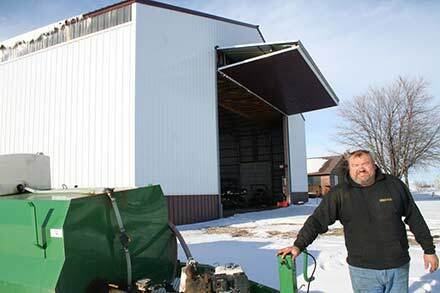 I guarantee you that after a few years you'll be replacing them after the wind picks them up, twists them around and when they get ice on the bottom so you can't slide them," said Rosenquist. "Since we've gone to the bifold doors, the doors always get shut so the birds and stuff ain't flying in. Before, when we had sliding doors, it was always a pain when you left them open for a day or more. If it's a windy day, or we know we are going to be out working for a time we shut our doors immediately, everything is alway buttoned up. It makes the place look a lot neater when everything is shut up. Schweiss doors don't ever wear out. 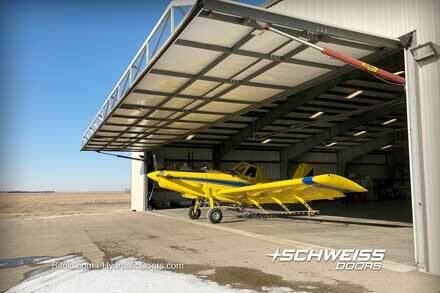 I think it is by far the best door on the market." 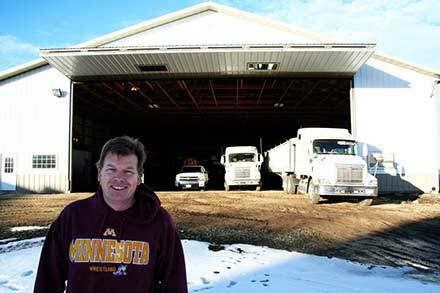 Competing on nearly every brand involved in racing during a pro career that stretched more than 15 years, Frans Rosenquist spent many winters away from his Atwater, Minnesota, farm carving a true legend. While Rosenquist raced as part of many teams during his long career - on the famous Team Frustration in the late 1970s as Yamaha factory driver at the dawn of the IFS era aboard an SSR in the later 70s and winner of the Kawasaki Tournament of Champions in 1981 - Frans was always very much his own man. Success is never easy in snowmobile racing, but Rosenquist often made it look effortless with a fast, smooth, consistent style and unflappable demeanor that made him a favorite with fans and fellow competitors alike. Starting as a teen on a Ski-Doo Super Olympic, Frans moved to T-Jets on the ASA circuit before hooking up with the Mercury Sno-Twister phenomenon of the late 1970s. 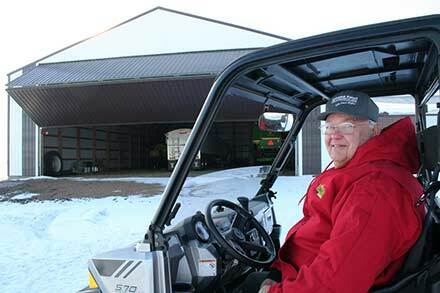 He raced Polaris for a time before moving to Yamaha and Ski-Doo, racing in Sno-Pro. Along the way, Rosenquist posted many championship seasons, scoring the #1 bib in ASA in 1976, the USSA #1 and the fabled Adema Cup in 1977. Frans qualified for the World's Championship a phenomenal six times, posting the fast qualifying time on a Ski-Doo single tracker in his final appearance in 1985. Frans returned briefly to competition in the early 90s, racing with his son, but when he hung the leathers up for good, he had amassed a racing record few can match and, all the way, he never rode in an ambulance. 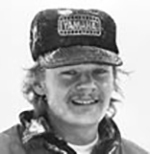 Rosenquist hitched up to the Ski-Doo factory team from 1981 to 1985. When you got on the factory 440 h.p. racing sleds, he said they were all very fast A lot of the success depended on the driver, there was a lot on the line and everybody drove hard. The fastest Rosenquist was clocked on a 1/2 mile track was 107 mph. All of Rosenquists bifold doors have liftstraps and autolatches. 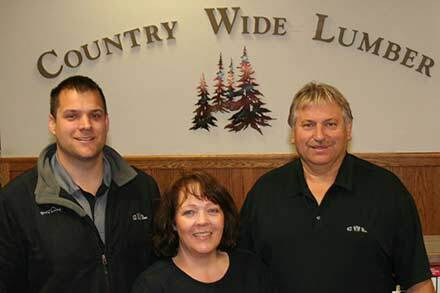 Windows allow extra natural light in during the day. 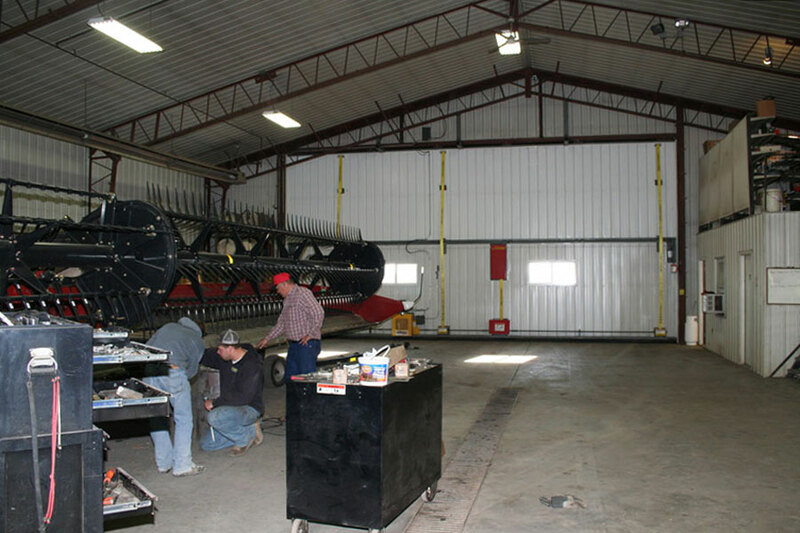 When you have a lot of machinery to store a big building with tall and wide bifold doors is a must. 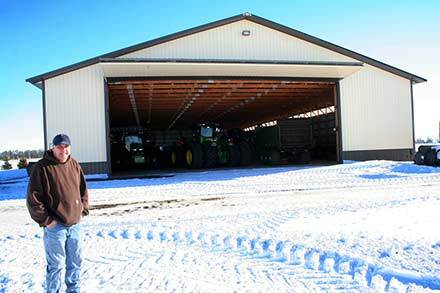 This cold storage machine shed keeps expensive farm tractors and implements out of the elements for the winter. 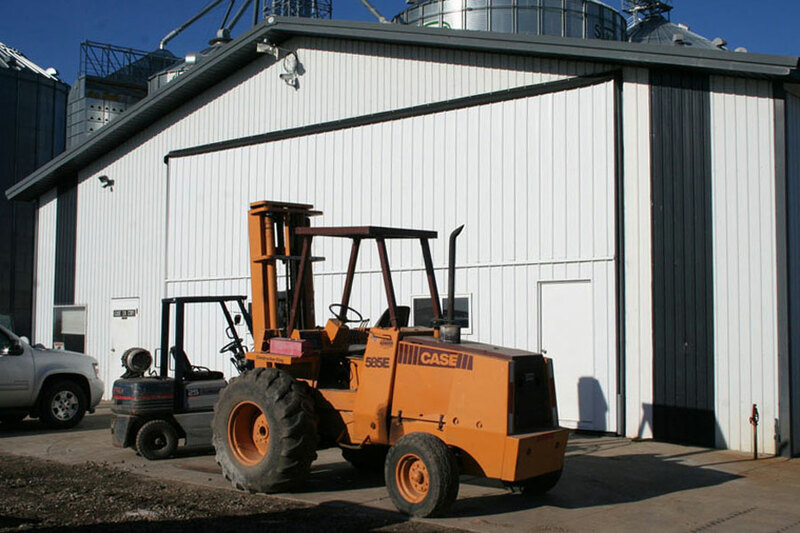 Custom cut door corners just below the eave of this machine shed allowed for a taller bifold door. 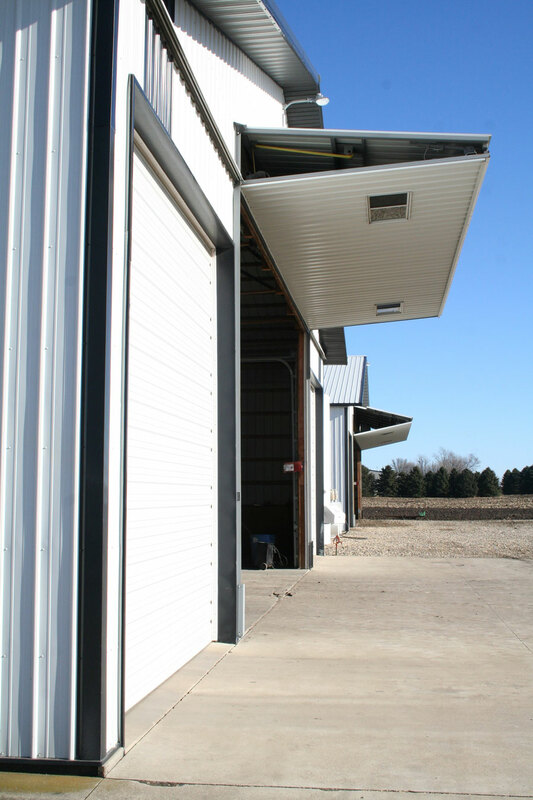 Three of Rosenquists buildings, all with bifold doors, are side-by-side for easy access. 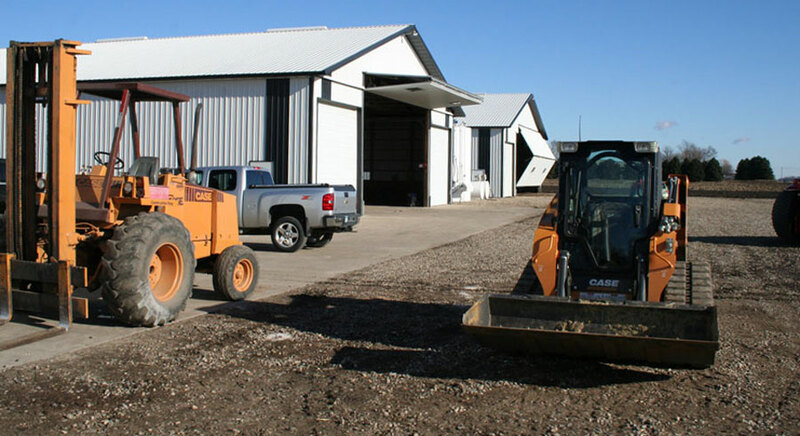 This building houses a farm office and heated shop. The 33' 10.5" x 15' bifold door has a walk door. 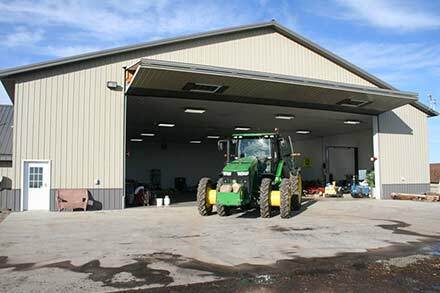 Wide bifold doors make it easy to move equipment in and out of the buildings. 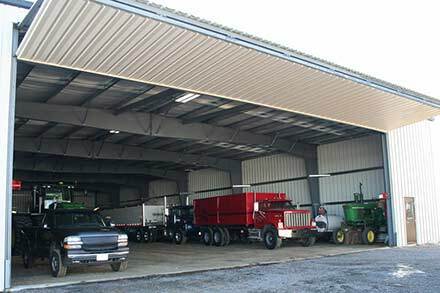 Moving semi-tractor trailers inside a large machine shed is a lot easier when you have wide bifold doors. 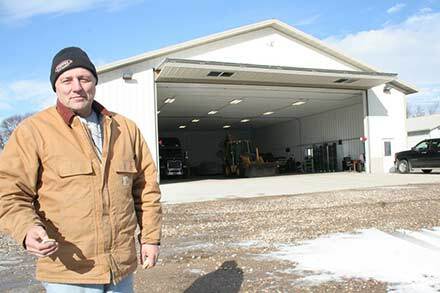 Rosenquist likes his bifold doors because he can park his loader inside and then drive out to remove snow in front of the buildings.